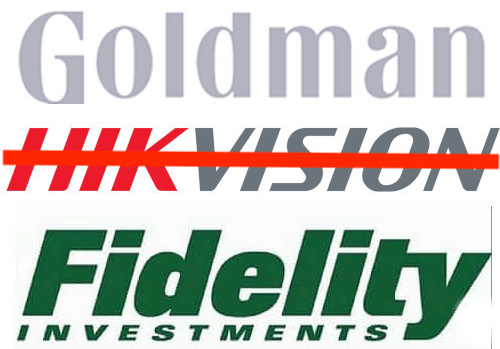 Major US funds run by financial giants such as Fidelity and Goldman Sachs have sold their equity stakes in Hikvision and Dahua "as scrutiny mounts in Washington over how western capital markets are being used to fund the mass detention of millions of Muslim Uighurs in China", reports The Financial Times. As first reported by IPVM, the two companies have won at least $1.2 billion in massive surveillance deals in Xinjiang since 2016. Hikvision, in particular, has won contracts which supply cameras to at least two of Xinjiang's notorious re-education camps and almost 1,000 mosques in a single county. ***** ** ***** *** by ********* ****** **** as ******** *** ******* Sachs **** **** ***** equity ****** ** ********* and ***** "** ******** mounts ** ********** **** how ******* ******* ******* are ***** **** ** fund ******* *********** ******** ** ****** Uighurs ** *****",******* *** ********* *****. ** ***** ******** ** IPVM, *** *** ********* have*** ** ***** $*. * billion** ******* ************ ***** in ******** ***** ****. Hikvision, ** **********, *** won ********* ***** ****** cameras **** ***** ***** ********'* ********* **-********* camps ********* *,*** ******* ** a ****** ******. *** ** **** ****** two ****** ******* ******* funds *** **** *** divested: *** ********** ***** Teachers’ ********** ****** (*******) *** *** *** York ***** ********’ ********** System (******). *** ** ****** **** all ** ***** ***** declined ** ******* ***** the ****. **** *** reached *** ** **** and **** ****** ** they *******. *** ** ******** **** the ***** *** ******* about *** ******** **** their *********/***** *********** ****** by *** *****' ********* Xinjiang ***********. all ******* ********* involved in the construction or operation of the ‘political education’ camps, or the provision or operation of surveillance technology or operations, across Xinjiang. *** ** ********** ******require ******* ********* ********* ** *******’* ******* ******* ** ******** ***** **** ** *** ******* **********’* ******** ********* *** ***** ****** ******. American investors and pensioners have a right to know this information given it poses material, asymmetric risks to the reputations and valuations of Chinese companies. ***** **** ** ***** have **** *********** ******* from ********* *** *****, in ***** **** ****** to ******* ******* ********** spending ** ********/************, *** only ** ******** *** also ** *********-***** *** ** **** video ************ ***** **** "Sharp ****". **** *****' ****** ******* record ***** ** ***** 2018 *** ***** ****** have **** ***** ** had ** *** **** for *** **-***** ***** war, ********* ***** **** ************ *** *****. ********* ***** ****** * chunk ** **** **** surveillance ******, ***** ** potentially * *** ******** financially *** ***** *****. The **** **** **** are ********* ***** ******** over ******** ** *** potential ********* ******** *******. **** ********** ***** ********* and ***** *** *** becoming ******** ***********, *** just ***********, *** ** their ******** **********. ***** this **** **** ****** effect ** *** *****' bottom ****, ** ***** hurt *** *****' ***** price *** ****** ***** overall **********. ********* *** **** ******** raised ******* ** ******* markets, **** ** **** ******* **** ****** ******* ** ****. At *** **** **** bond **** ****** ********** unnoticed, *******, **** **** bond ** ** ******** today, ** ***** ****** raise ********** **** *********, politicians, *** ****** *** to ********. * *** ** ********* talk ***** ******* ********* but **** ** ***** to ********* *** ******** they *** ***** ** fill ***** *****. ** is ****** ************. ******:*** *** *** *** a ******-** ****** ******* out ** ******* ********* *** ***** ******** in ***** *** *********. ******* ******** ** ******* Dahua ** *** ***** world ******* ****. ****'* a ****** ******* **** they "****" * ********** son ** ********* ******* in ******. *'* ***** **** *** industry ** ******* ******** and ****** *** ******* waking **. * ***'* tell *** *** **** I *** ****** **** our ********** *** ********* tell ** **** ***'* care ***** ***** ** Hikvision ** *** ** it, **** **** **** a ***** **** *** no *********. ****** ******** do ****** ******* *****, especially *** *** *** your *****. ** ******* always ********** ****** ******* our ****** *** ****** and ********** **** ****** erode *** ****** ******... its ***** ** ****** the ***** ***** **** easy ******... *** ** still ** *** **** to *** ** ****** make *** ***** *******. *** *** ****** ** left ***** ** *** own *** ** *** growing ******** ********, ***** all **** ** * head **** *** ***** botnet. ** **** *** ONLY ******** ************ ** Dahua ** ***** * stop-ship ***** *** ******* was ********. **'** ***** sold ***** ***** ****. Hindsight ** **** *** I **** ***** ** the ***** **** ** this *****, **** ** we ****'* ******* ** predict *** ****** **********, I'm **** **'** *** supporting **** *******.